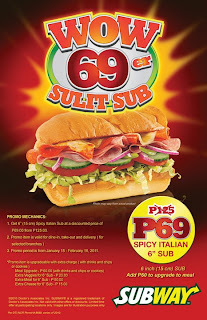 I was looking for a snack I can take out, I noticed the SUBWAY store at SM North EDSA and decided to order Ham Sandwich with sweet onion sauce. Here's a delicious sandwich treat after a busy day at work! I love their Chocolate Cookies! First, Decide what sandwich you want. Spicy Italian, Subway Club, Subway Melt, Tuna, Ham, Veggie Delite, Roasted Chicken, Chicken Teriyaki, Roasted Beef and Sliced Chicken. 2. Choose from Ham, Chicken, Roasted Chicken, Chicken Teriyaki, Roast Beef, Sliced Chicken, Sliced Chicken and Ham. 3. Decide your veggies and be specific. Add cheese! Enjoy your healthy meal at Subway Restaurant! Bdw, get your 6'' spicy Italian Sub at a discounted price of P69 from P125. Promo Period is from Jan 15-Feb 15, 2011 only!